Dwarf clawed frogs are usually a light brownish-gray color with darker spots. While they are sometimes light in color, albino coloration is generally limited to the larger African clawed frogs, not dwarf clawed frogs. Juvenile clawed frogs are similar in appearance to dwarf frogs. Look for webbing between the front toes; dwarf clawed frogs have webbed front feet while the larger clawed frogs do not. Names: Dwarf clawed frog, Zaire clawed frog, Hymenochirus, Hymenochirus boettgeri. Size: Dwarf clawed frogs reach an adult size of about 1 to 1 1/2 inches long. Dwarf clawed frogs like to have hiding spots. They can be kept in groups as well as within a community of tropical fish. The fish should be of a similar size as the frogs, however; if the fish are smaller, the frogs may try to eat them, and if the fish are larger they may try to eat the frogs. Dwarf clawed frogs do not need a huge tank—allow about a gallon per frog. They can be kept in groups or with peaceful community fish that are approximately the same size, but be sure to increase the size of the tank accordingly. Avoid tall, deep tanks as the frogs need to easily get to the surface to breathe. Leave a pocket of air between the top of the water and the tank lid. Also, a tight-fitting lid is a necessity as these frogs will try to escape. Use live or silk plants in the tank. Also provide hiding places using aquarium decorations, driftwood, or small terra cotta plant pots placed on their sides. Any decorations, including artificial plants, must be smooth so as not to damage the frogs' delicate skin. A land area is not required as dwarf frogs are completely aquatic. Make sure never to use soap to clean the tank or any buckets or other implements used in maintenance. Amphibians have very porous skin and are quite sensitive to chemicals and detergents. Dwarf clawed frogs should not be handled. Use only dechlorinated water in the tank; use conditioner drops from the pet store. Filtration is not strictly necessary if you keep only frogs in the tank (use frequent partial water changes), but if you add fish a filter will be necessary. Use one that disturbs the water as little as possible as frogs like still water, and make sure the frogs cannot get stuck in the intakes or behind the intake/filter. Dwarf clawed frogs should be kept at temperatures in the range of 75–80 F (24–27 C). You can use sand or smooth gravel on the bottom of the tank. Do not use gravel that is too large or the frogs may get their legs trapped between the gravel pieces. Make sure the frogs are not ingesting the sand or gravel when feeding. If this occurs, you can try a different size of gravel, or feed on a small saucer that is placed underwater on top of the gravel; use a dropper to place the food items directly on the saucer underwater. For this reason, you should only buy frogs that you are sure are captive-bred locally and tested to be free of disease. It may be impossible to find frogs that meet these conditions, but otherwise, pet frogs may be contributing to the decline of wild frog populations. Dwarf clawed frogs are bottom feeders and should be fed sinking foods. Live frozen foods or freeze-dried foods can be used, and a variety is probably best. Pet dwarf clawed frogs should be fed once or twice a day. Bloodworms, tubifex worms, daphnia, brine shrimp, blackworms, or chopped (bite-sized) earthworms... dwarf clawed frogs gulp the food into their mouths and swallow it whole. They rarely accept flaked food; some will accept pelleted food (get frog-specific pellets), but these can quickly foul the water. These amphibians are prone to two types of infections: bacterial and fungal. The signs of a more serious type of fungal infection include a white growth that resembles cotton on the skin, as well as discolored eyes. If the frog has a bacterial infection, it may be due to poor water quality in its tank. A bacterial infection is marked by cloudy eyes and redness or sores on the skin. Both conditions require attention from an aquatic veterinarian. These frogs are brown or dull green in color, and have three "claws" on their back feet. They live primarily at the bottom of their tanks, but do need to be able to surface for air occasionally. Healthy frogs are active swimmers that hide frequently and have clear eyes and smooth skin. Don't overcrowd your frog's tank, however, because such conditions stress them and can lead to health issues. Maturity is reached at about nine months. Males develop glands that look like small pink or white bumps behind the front legs. The males will also sing or hum, trying to attract a mate. The females tend to be slightly larger than the males and have a more prominent bump where the cloaca is located between the hind legs. Dwarf clawed frogs are often confused with African dwarf frogs. The differences aren't just in the claws. The clawed frog has eyes on the top of its head, while the dwarf frog's eyes are on the side of its head. Clawed frogs have flat snouts while dwarf frogs have pointed snouts. 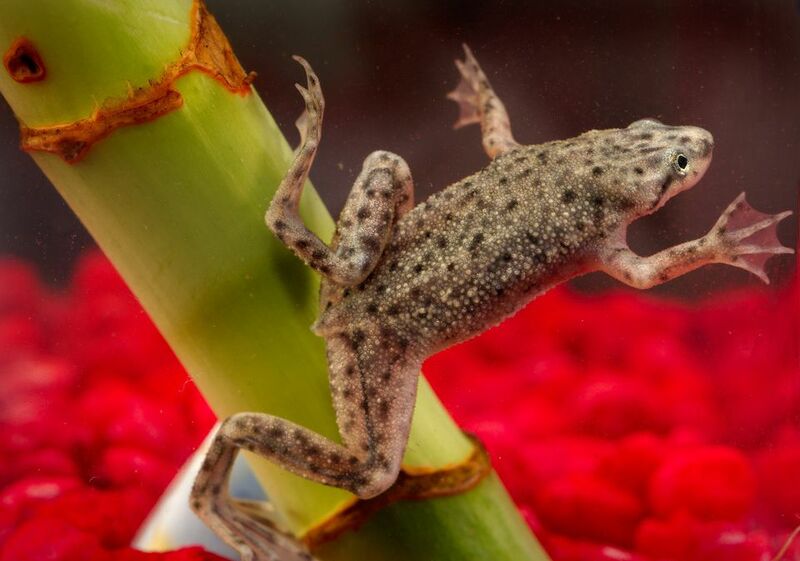 Finally, dwarf frogs have four webbed feed; clawed frogs have webbed back feet and digits on their front feet. Otherwise check out all of our other frog profiles.